Mike Lowery likes silliness. He illustrates it every day in children's books and greeting cards. 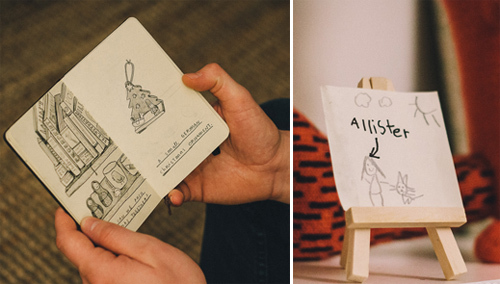 He's constantly drawing and scribbling new ideas that are offbeat and make kids giggle. He first hand draws fonts and images in his journal, then cleans them up and adds color on the computer. 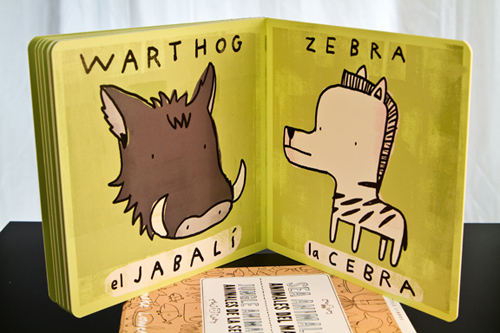 I love his style of illustration of these "Two Little Libros" books that are made for kids learning to speak both English and Spanish. Mike lives in an atomic ranch home in Decatur, Georgia along with his wife, Katrin Wiehle, who is a German children's book illustrator and Mike's young daughter, Allister. As they both are in the book business, books are plentiful. They love anything art related such as graphic novels, illustrations annuals and design publications. Mike, "We also buy loads of children's books here in the States and when we travel, so we've accumulated a small library of international children's books." 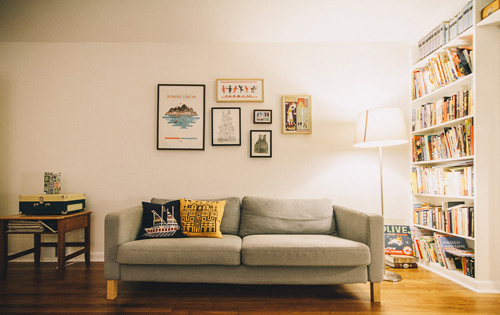 There is a pretty simplicity to their space which I really admire and appreciate. Mike shared a few links to art found in their home; Alex Todaro, Stuart Kolakovic, About Today and Modern Anthem. Mike has an equal passion in music and loves to dabble in, as he shared, "indie rock with some synthesizers." Currently, Mike is Professor of Illustration at SCAD Atlanta and is working on a series of books for Simon and Schuster and greeting cards for Hallmark.